What you'll discover as you browse the internet is that there's a whole ton of people who have built their own studio desks, but very few ever documented the process meticulously in terms of isometric engineering sketches or even your typical carpentry blueprints on a dirty napkin. This is the same conundrum we face in the world of computer desks and essentially every other kind. You might find a series of time lapse photos showing the build in progress, but rarely the dimensions and step-by-step process. In the same vein, today we want to help you think about how to do it yourself, instead of dropping plans on you with no guidance. What's the point in shopping for design plans if it's not customized to fit your needs? It's no different than shopping for pre-constructed desks, except this time you have to build it too. So that is the barrier to entry. The hurdle you have to be able to leap is knowing how measure, cut, and connect all of this wood and then stain it and seal it to make it attractive. If you can do that well, you can save a ton of cash. With that said, let's consider all of the various things you'll want to consider as you map out your design. What's the Attraction of a DIY Studio Desk? 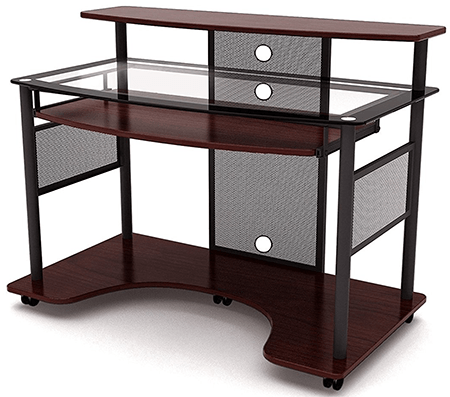 The reason for the lack of design plans out there is that people only decide to build a custom desk for the very reason that they have custom needs or preferences that aren't going to translate over to your desires. The other main reason you don't find many legitimate studio desk plans out there is that we tend to wing it as we go and do so in a modular fashion. Modularity means we might build the main surface before adding special cubbies for rack rails and rackmount equipment. Then we might add speaker monitor stands off to the sides if we haven't soffit mounted them. 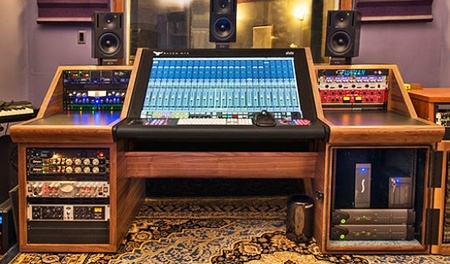 Some of us may want a tilted table surface with a digital console mixer embedded in it. You can see why these are rarely ever perfectly planned out from conception. Another reason, besides being able to tailor the desk to your specific needs, is that it can be incredibly cheaper to build your own desk. This math only works out if you already have access to woodworking tools and you don't count the cost of the free time to construct the build. If you can weasel yourself into that situation, you can have a great time with this kind of project and end up with a desk that you appreciate because you created it. What Features Should I Consider For My Studio Desk Plans? It helps to think about several things before you get started, because there are 'points of no return,' in building where it's too late to make a certain addition without starting over at least on parts of the build. It's like ole grandpappy used to say, "Measure twice, cut once." 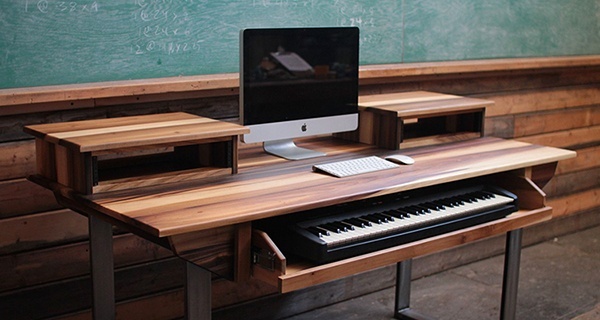 This desk contains a lot of the options you'd consider on a typical style of workspace. We need to think clearly and fully through our needs and desires before we ever start cutting a board. First and foremost you need to think about the biggest surface that everything else depends upon. Something to consider is that the industry standard for desk height is 29 inches. Now, that doesn't mean yours needs to be at 29 inches, but that that height is the one-size-fits-all solution for large manufacturers that helps them save money by not allowing for customization. You may be a taller or shorter person, have a different preference, on want to make room underneath for a slide-out typing or musical keyboard. But 29 inches is a great point to start your considerations from. The width and depth of your desk, in my opinion, is one of the most important parts to get right. It is most certainly better to overkill here than to end up with a desk that cramps your style. I recommend having at minimum 40 inches in width, if not 60 inches. In terms of depth, the distance out in front of you as you're seated at the desk, I'd have at least 30 inches. If you intend on adding some shelving units that aren't of a floating nature or aren't cubbies with space underneath them, you may consider extending the depth even more. Make sure you have enough depth after adding a shelf. The reason for having enough depth is that if you add a second tier of desk to hold your computer screen and studio monitors, it'll start to cannibalize your available desk space. You don't want to end up with so little depth on the main tier of the desk that you can't comfortably type, use your computer mouse, or set your mixing console or monitor controller on it, etc. When thinking about the width of your desk, you need to consider how many computer screens you're using and how much space they take up. The reason for this is that if you have more than two screens, especially 24 inch or wider ones, they'll be so wide you won't have space for your speaker monitors to be placed in their proper mix position. I'm facing this issue now at home and have been tolerating my speakers laying on their sides so they can peek out from under the screens. Thankfully I'm not mixing here but it does harm my listening experience. I'm going to downgrade from three 24 inch screens to one 34 inch ultrawide monitor soon for this very reason. Make sure you choose a width that can accommodate all of this equipment. There are several ways to handle this if it's an addition you'd enjoy on your desk. The idea is to boost the height of your computer screens and mixing monitors to match the level of your eyes and ears as you're seated comfortably. The space beneath this shelving can be used for storage of a MIDI controller, papers and pens, or can be rigged with rack rails so you can install your most used rackmounted equipment closer to you. This works well with audio interfaces, compressors, equalizers, and anything else that requires constant tweaking. Monitor shelves with possible rack space underneath. In the case of the desk above, the builder chose to make isolated speaker shelves, but they could have easily let the shelf run the full width of the desktop. The choice is yours. If you use an articulating computer monitor arm you may enjoy the look of a floating screen that you can pull closer or move to the side mixing. You'll want to consider, especially when deciding on the height of the desktop itself, if you'll be including a slide-out drawer surface that will hold a typing keyboard or perhaps even a musical keyboard. It will need to support more weight than you suspect, beyond just the weight of the device itself, since you'll be adding on with your hands and maybe leaning on it with your arms. If you add a sliding shelf for a keyboard, don't forget to compensate for the loss of leg space. 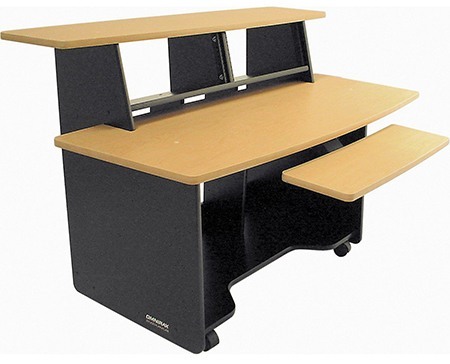 If you meticulously determine the perfect height for your desk and then add a 6 inch sliding compartment to the bottom, this will definitely interfere with your legs resting comfortably under the desk. You'll have to make a compromise somewhere, probably by raising the overall height of the desktop. 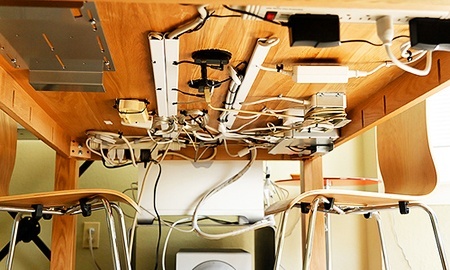 Technically, if you follow most of the ideas above and pictured, you won't have much of a cable management problem. Nearly every cable should be pointed out of the back of the desk and down behind it or under it. But if you want to route some cables straight through the desk you can do that with what are known as 'hole saws,' which are basically drill bit attachments of a handsaw wrapped in a circle to bore out holes. You can also use paddle bits, but finding one large enough might be tricky and unstable. Don't underestimate the influence of visual cleanliness on productivity. There are standard widths used for the hole diameters, with the most typical being 2 inches. That's big enough to get plugs through without being too big. 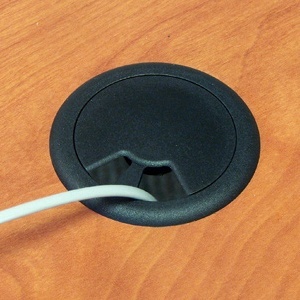 But if you stick to these standards, you can buy plastic grommets to cover them and keep the cables tight together, like pictured above. Though I'd rather have a power conditioner, this is a great solution for those with less equipment. You may also choose to pre-think your power management by installing power strips alongside the bottom of your desk or on the back of a leg. Basically anywhere where it isn't visible and you can't see a ton of cables flying everywhere is the goal. But if you decide to install rack space on the top or along the bottom where you might have cabinets and drawers, you can install power conditioners that'll take care of any power issues and cable management messes that would have arisen from them. Finally, if your desk is wide enough, you can take advantage of that space by installing more rack rails where you might have included cabinets and drawers. The advantage here is that not only will this act as your vertical supports for your desk, like the legs of a table, but will bring all of your rackmount equipment closer. 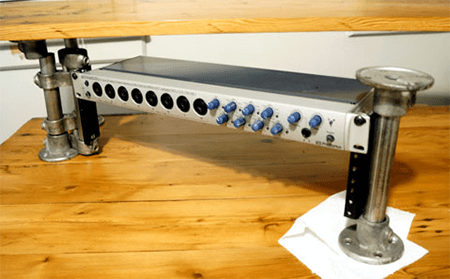 When recording and mixing, having close access to signal processors will save you a ton of annoyance, since you won't have to leave your seat in the mix position. Having all of your rackmounted hardware in range while mixing is a blessing. My suggestion is to rack your most used equipment on top of the desk in the cubby holes we discussed. These are the items that you need to touch most frequently, like a mix control station for the band, a recording interface, equalizers, etc. Then the next most used equipment should go in the top of the rack space installed in place of cabinets and legs. The least used should go in the bottom alongside the power conditioners. For the sake of brevity we won't be going into a ton of detail here. The assumption is that you're familiar with general build materials and the tools needed to work with them or have the guidance of someone who does. You're going to first want to consider what material you'll use for your main work surface, which may very well be the same as the cabinets and legs. You can decrease the weight of the overall structure by choosing a material such as compressed particle board. It's similar to plywood which is compressed strips of scrapped wood. The difference is particle board is compressed dust, essentially, with laminated outer layers. You likely experienced material like this on your school desk and lunch room tables. The downside is that humidity and liquid can create bubbling and uneven surfaces, so you need to know that you're using it in a controlled environment. If you choose to use solid hard wood, expect a heavier but sturdier build. You don't need to use pressure treated wood, but you'll want to choose a wood that is harder than a soft wood like pine, which will end up with a lot of indentations and scratches over time. 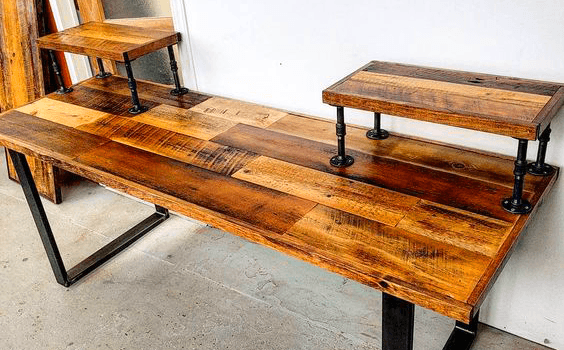 You will likely want to stain the wood to achieve the color you prefer, as well as seal it with polyurethane to protect it from liquids, scratches, and humidity. Piping makes great structural support, including the legs and frame of a desk. In the picture above you can see pipes were used for the shelving supports and placed at the proper 19 inches apart to accommodate rack rails and rackmount hardware. Since rack rails and their hardware are standardized, you can easily order packs of what you need without over-buying or having to cut them to size. While most of the studio guys in the DIY community end up posting pictures of the final results of their builds and nothing more, there are a few high-quality picture tutorials out there. You won't find measurements and advice but you can at least get an idea of the workload and methods used. There are also some plans you can purchase out there, which may be decent starting points for you to then customize. Consider This: I recommend you to tread carefully if you aren't comfortable and experienced with complicated builds. You can end up costing yourself a lot of money, time, and frustration while ending up with a shoddy result that doesn't match your expectations. If you're okay with that and would like to gain the experience and practice, then by all means go for it. There's only one way to learn. Those should get your creativity flowing. But if you've looked at them and started to feel overwhelmed or demotivated to pursue a full build on your own, let's look at some decent pre-built options tailored for music makers. 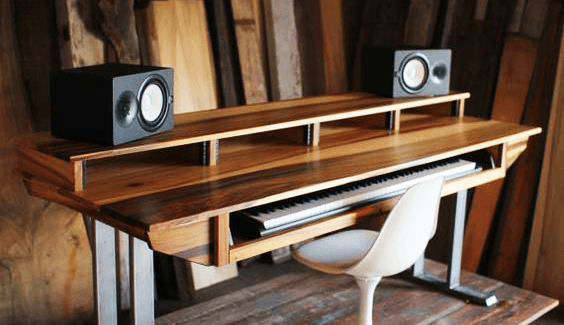 Popular Studio Desks - Assemble & Make Music! Maybe you're dreaming about a do-it-yourself desk but you're not quite ready to take the plunge. Maybe you don't have the tools, or you're not in your "forever house" and want to wait. 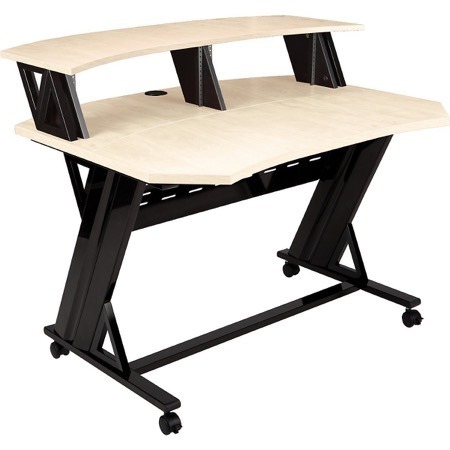 In the meantime there are a few great studio desk options that can take care of your needs relatively inexpensively. These are created in a way that they can be boxed and shipped to you and you do the assembly in a matter of an hour in the room you'll use it. They aren't so pricey you feel you have to keep them forever but are nice enough that you could keep them, pass them down, or sell them locally once you're ready to make your own desk design. Note: Each image and text link leads to Amazon.com where you can read additional user reviews, find specific technical detail listings, see additional product options, and make your purchase. Even if you're still determined to build your own desk, take a look at these for extra design ideas and features you may like to add in. This Studio RTA Producer Station is for the studio engineer and mixer who either already has a ton of rackmount hardware or intends on growing a collection. This beast features two 10 unit rack rails on both sides of the sliding keyboard tray, plus another 4 up top. That's 24 rack units for your compressors, preamplifiers, equalizers, interface, and more. Additionally you have around 4 tiers of shelving and desk space available to stack and stagger your MIDI controller, a mixer, a desktop talkback mic, your studio monitors and computer screen, and whatever else you use. They took cable management into consideration too. This is the best bang for your buck for easily available and reasonably priced home studio desks, without a doubt. You may not want such a big desk like the one above, but still value a good bit of rack space to keep your essential gear close. The Studio Trends desk here, as well as the Onmirax Presto below, have 8 total rackmount units ready to go, as well as plenty of leftover desk depth for you to spread out across. You also get a full width secondary shelf for a computer screen and your monitors. This isn't groundbreaking, but it's a solid build that gets the job done in tight spaces. They actually have what are called 'side car' studio racks you can purchase separately to extend the width and number of rack spaces available too. You can add one on either side or really however you want it. 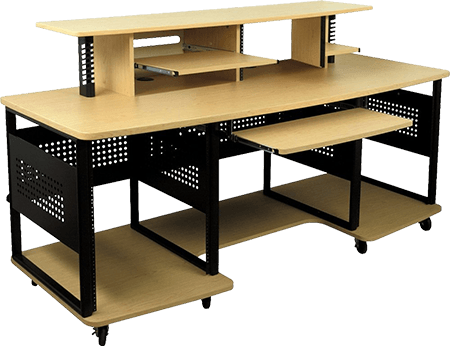 The Omnirax Presto desk isn't much different than the one above, except the depth of the desktop doesn't extend past the rack rails. On this one it is assumed that you will be using that space for racked gear. What I like about this desk versus the Studio Trends one above is the less minimal design. I'm normally a fan of minimalism but these solid black sides are attractive to me. They provide cable management, or at least hide the mess, well. You can store baskets of cables and mics below the keyboard tray, which I should mention is not included and must be added separately. I had to add this Z-Line Designs Cyrus desk to the list. It's not strictly a studio desk but it is such an affordable and well built option I wanted to draw attention to it. Trust me when I say it's affordable compared to the others, on the order of a fraction of the price. The only problem is that you're lacking any rack space here but the truth of the matter is a ton of the new generation mixes entirely in-the-box with plugins, so this might be a cost-effective option for the younger engineers coming up in the game. I included it mainly due to the triple-tiered desktop. That keyboard tray is pretty big, nearly the same size as the clear glass desktop itself above, with a full-width shelf on top for your speakers and screen. You can toss your desktop computer tower underneath to keep it off the floor, and it features pre-built cable management grommets on the back. It's a mature and sleek looking desk for sure! 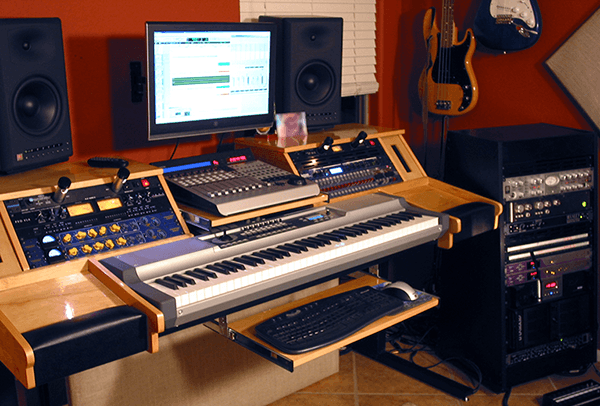 It's unfortunate that there's a decent demand for a do-it-yourself solution to desks for studio musicians, but the reality is that those needs are typically custom and based on the preferences of the builder, so nobody can offer a catch-all solution. Each of us have different sized rooms, various numbers of computer monitors, and so forth. And when we're in the midst of constructing a desk, we fail to take pictures or document measurements and scan blueprints. Beyond that, you're on your own! Good luck and be safe with the tools! Hopefully our discussion above will at least help you decide exactly which features you want to include in your own DIY studio desk.